Red Lobster Shrimp Nachos are one of my favorite nachos to serve. I love their combination of Cheddar and Monterey Jack cheese served over crisp nacho chips, and then topped with pico de gallo and shrimp. I almost think you can make a meal out of this and another one of their other appetizers for a complete meal. The cheese that tops these nachos is thick and creamy and so much better than just a cheddar cheese sauce. So you are in for a real treat with these nachos. When I recreated this dish in my own kitchen I made one significant change, when you order this dish in the restaurant, it is served with a much smaller shrimp than what I chose to make here. I used a medium sized shrimp, I wanted a nice big bite of shrimp so this recipe could be served up as a meal, not just an appetizer. When I was playing around with this recipe I tried a couple of things I didn’t put in the final recipe, but I tried lightly brushing the shrimp with a garlic butter sauce and grilling the shrimp. I also tried boiling the shrimp in crab boil. Both of those ways were really good, but when you have the nachos in the restaurant they don’t prepare the shrimp either way. 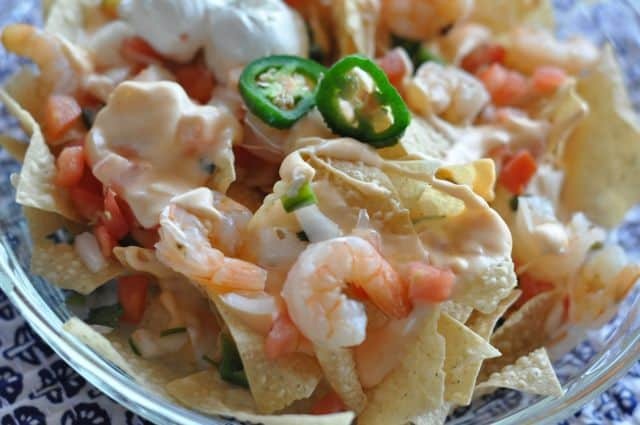 Red Lobster Shrimp Nachos can be made at home, and they taste just like they do in the restaurant. If you purchase frozen shrimp thaw shrimp completely before cooking. You can place them in a sieve and simply rinse cold water over them until they thaw. Drop the shrimp into a medium-sized pot of boiling water. I personally like to add a little crab boil seasoning to the water to give the shrimp an additional layer of flavor. This is not necessary. Cook shrimp until they turn pink, and remove immediately, this will only take 2 to 4 minutes. Prepare cheese sauce by combining Monterey Jack cheese, Cheddar cheese, and cream cheese in a medium-sized pot over a low to medium heat. Add milk to thin the sauce, you can add additional milk if you desire. Preheat the oven to 350 degrees, place nacho chips on a heat-resistant plate. You will want to heat the chips until they are crisp. Heat chips for approximately 5 to 7 minutes. While the chips are heating prepare the pico de gallo by combining the tomatoes, chopped jalapeno pepper, onion, together. Assemble the nachos by spooning cheese sauce over the nachos. Then top with the pico de gallo you just made, top with shrimp. Garnish your nachos with sour cream, and slices of fresh jalapeno peppers. oh no! They were great! Stephanie… Alfredo made from scratch is the base they is for the nacho sauce just so you know. My husband and I think these are just as good, if not better than Red Lobster’s. I’m so glad I found this recipe! I LOVE these nachos, but hate spending the $10 every time I want them. Thank you for this recipe. I can’t wait to try it. I’ve always held to the thory that ifyou love the ingredients, you will love the dish. This proves that rule. I agree with your theory and I try it a lot with new recipes for my wife. Rarely does she agree with you and I. But I keep trying! I am really liking this seafood nacho platter! i love nachos.. but never tried with prawns. I’ve tried this recipes and I love the cheezy taste!..